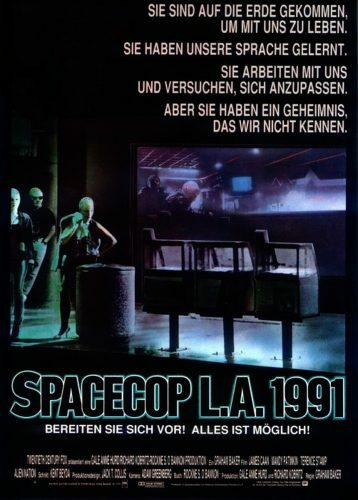 Tagline: Los Angeles, 1991. They have come to Earth to live among us. They’ve learned the language, taken jobs, and tried to fit in. But there’s something about them we don’t know. 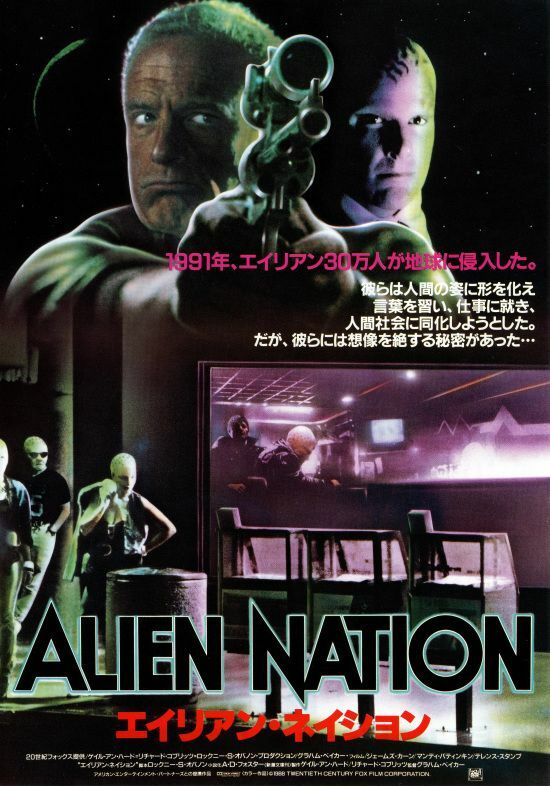 Alien Nation is a movie with a lot of potential. It simply doesn’t live up to that potential, or even really attempt to. Promising something quite unique in its initial set-up, the movie soon treads familiar territory as an auspicious opening quickly descends into a bog-standard buddy cop movie, one that wouldn’t look out of place as a McBain skit on an episode of The Simpsons. It hurts me to write such a negative review because the director proves himself more than competent. The movie also has a wonderful cast at its disposal, including the Oscar-nominated James Caan, who gives a typically magnetic performance as our hard-boiled antihero, the wonderful Terrance Stamp, unrecognisable as treacherous alien antagonist William Harcourt, adding some much welcome menace to a largely bland criminal underworld. The story, too, has an interesting premise. It is 1991, three years after an alien spacecraft carrying thousands of slaves was abandoned on Earth, and public tensions have hit fever pitch. Obviously learning nothing from the Cuban refugee crisis which swept Miami only a decade earlier, a suddenly benevolent US government welcomes its superior visitors with open arms, a fact that doesn’t sit well with the general public, who are understandably concerned about being displaced in an already tenuous climate of poverty and joblessness, a fact that sees their nationalistic tendencies blossom. Detective Matthew Sykes (Caan) soon joins the realms of the casually xenophobic when his partner is gunned down by two extraterrestrials, who in spite of having never left American soil sound contemporaneously Russian. Russia’s that a way, pal! Cinema is inherently fascist, and this is America in the grip of Cold War frenzy, so you can probably overlook a dash of jingoism when it comes to delineating the good folks from the bad, but for a movie which opens with a morality play regarding racial inequality, it smacks a little too much of hypocrisy, and only serves to undermine any kind of ethical or political aspirations. Mercifully, those aspirations are quickly forgotten, and what we are left with is a thoroughly unambitious retread of the same old odd couple formula. You know the one, two opposites get paired and have a hard time hitting it off but commonality gradually rears itself, leaving our opposites inseparable after little more than a couple of days. Sykes isn’t racist, that much is made explicitly clear by not only his deceased black partner, but also an Asian coroner who shares in his world-weary cynicism. He is hotheaded, however, and his alien compadre — the first Earth detective of his species — is positively straight-laced, leading to a series of not-so-humorous scenes which are executed with the kind of rushed complacency that typifies the movie. Just keep smiling, buddy. You’ll fit right in. In spite of its hackneyed formula, the movie presents itself as something fresh and unique with a plethora of thinly veiled gimmicks. 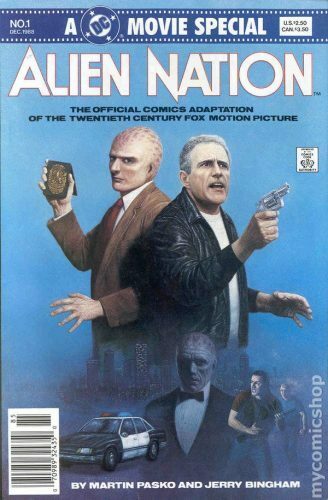 I wanted to buy into Alien Nation because of its seeming potential, but it is all so lazy and transparent, from the not-too-dissimilar physiology of our alien visitors to a narrative involving an extraterrestrial drug not unlike cocaine, one which threatens to enslave our stranded species until our bulbous-headed protagonist takes a tip from his Yankee partner and throws away the rule book, resulting in an excruciating good cop/bad cop routine as our heroes stumble toward a climax of stark complacency. But the film’s idleness runs even deeper than formulaic plotting. After all, those buddy movies which achieve greatness invariably do so thanks to snappy dialogue and an endearing onscreen chemistry — think Shane Black and the guys from Lethal Weapon — but the camaraderie invariably falls flat, consisting of idiosyncrasies which either lack imagination or are convenient plot devices designed to move the story forwards. Our alien detective, played with commendable understatement by Mandy Patinkin, is lumbered with so many duds that you begin to feel for him. The movie’s cast deserved so much more. Here on Earth, we like to shoot people. The alien protagonist’s Earth name is Sam Francisco — yes, you read that right — and his races’ penchant for deep fried badger is predictably scorned upon by his human partner. Also, alcohol has no effect on him, sour milk being the inebriating libation of choice, which is quite convenient when Sam Fran, quickly renamed George by Sykes, visits his partner’s apartment to discover he is the kind of crook-hungry cop whose otherwise empty fridge is full of the stuff. Oh yeah, and salt water is like sulphuric acid to these fellers, which gives you some idea of where the movie is heading for a finale which arrives in the blink of an eye. To be honest, there are none of any real note, with even the potential spectacle of an acid bath somehow underwhelming, but Sykes’ partner has a particularly large hole blown in him by an alien super bullet, resulting in the kind of paint can deluge synonymous with action movies of the period. There is a serious lack of absurd moments in a movie which masquerades as something eccentric yet meaningful, but the sight of Terrance Stamp’s Harcourt undergoing some kind of steroid-induced metamorphosis after a drug overdose probably pips it. After a night listening to inane jokes with his new buddy Sykes, George wakes up with a serious hangover following one too many sour milks. George: I feel very terrible. Ohhh, I’m so milked over! Shane Black eat your heart out! 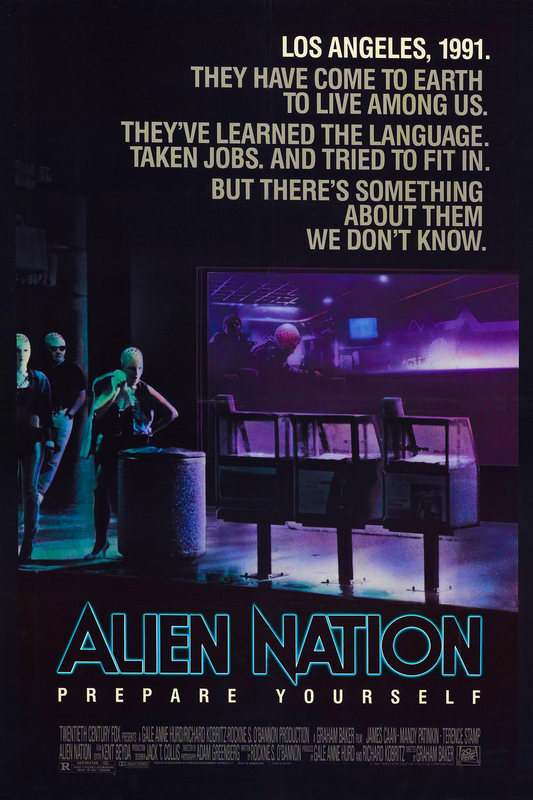 Competently made and with a stellar cast to boot, Alien Nation could have been so much more — particularly as a critique on modern capitalism. A bog standard action flick that fails to live up to a potentially winning concept.